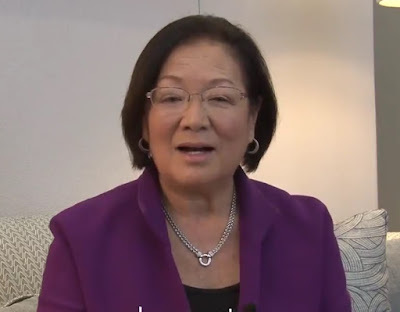 U.S. Sen. Mazie Hirono, who was diagnosed with stage 4 kidney cancer and had a kidney removed in May, announced Tuesday that she has “some small spots in my thyroid gland.” Star-Advertiser. Sen. Mazie Hirono has a video update on her fight against cancer. KITV. Gov. David Ige’s administration is pursuing a private tax agreement with Airbnb Inc. that would allow the vacation rental company to collect taxes from its hosts and send the money to the state. Star-Advertiser. The proverbial “tip of the spear” is about to get sharper in Asia with 10 of the Air Force’s advanced F-35A stealth aircraft transiting through Hawaii on their way to the first operational deployment for the attack planes to Japan. Star-Advertiser. HMSA and Kaiser to raise Obamacare rates Jan. 1. The state approved an average 19.8 percent rate hike for Hawaii Medical Service Association and a 24.1 percent increase for Kaiser Permanente’s Obamacare health plans. Star-Advertiser. Native Hawaiian Health Task Force Isn’t Giving Up The Fight. After racing to craft legislation in just five days last session, the group’s members want to continue addressing ethnic health disparities. Civil Beat. The Hawaii Longline Association may join the court battle over foreign fishermen and whether they should be licensed to fish in Hawaii waters despite being barred from stepping on U.S. soil. Star-Advertiser. Lost-at-sea saga marked by inconsistencies, changing stories. The dramatic story of two Honolulu women who were lost at sea for nearly six months before being rescued by the U.S. Navy played out on front pages and websites worldwide. Associated Press. A locations assistant on “Hawaii Five-0” sued CBS, alleging an employee harassed her repeatedly for over a year by pursuing unwanted sexual contact and threatening to light her and her desk on fire, among other things. Tribune News Service. Medical Cannabis vs Prescription Opiate Pain Killers. More than 33,000 Americans died from opioid overdoses last year. Local medical cannabis proponents say many of these deaths can be prevented. Hawaii Public Radio. It’s Hard To Say Where Homeless People Go After Sweeps. City and state data on their whereabouts is spotty. Advocates say permanent housing is the only true solution. Civil Beat. Tenants, landlord clash at Kewalo Basin harbor. Two small businesses operating charter boats in Honolulu have been caught up in a dispute with the contractor running a state-owned harbor. Star-Advertiser. The state of Hawaii’s Princess Victoria Kamamalu Building in Downtown Honolulu has re-opened after being vacant for more than a dozen years, following an extensive $27 million renovation that included asbestos abatement. Pacific Business News. Former charter school director charged with theft. Laara Allbrett, who was the director of Halau Lokahi, was charged Monday with four counts of second-degree theft. KHON2. The city levies big fines against homeowners — and then waives most of them. For the past eight years, the former owners of a Waikiki property on the corner of Kalaimoku and Kuhio streets have been accruing fines at a rate of $100 per day, for a variety of land use violations. Hawaii News Now. Owner of Kapolei oil refinery celebrates first anniversary in Hawaii. Island Energy Services LLC, the company that took over the Hawaii-based assets of Chevron Corp., is celebrating its one-year anniversary in the Islands on Wednesday. Pacific Business News. Bikeshare Hawaii CEO pleased by growth, says Biki is evolving. Star-Advertiser. Pali Momi Medical Center on Monday opened its Hawaii Pacific Health Cancer Center, the first of its kind in West Oahu. Pacific Business News. Mum’s the word: DWS explains silence on two North Kona deep well failures in October. For at least a couple of days in the heart of October and during the thick of the Ironman World Championship, Hawaii County was down five of its 13 deep wells in North Kona. West Hawaii Today. Resurfacing project on Waianuenue Avenue to begin Nov. 13. For nine days, Waianuenue Avenue will be reduced to one lane only between Kamehameha Avenue and Kaiulani Street as workers repair the road’s deteriorated surface. Tribune-Herald. The recently vacated Keaau Village Market will be replaced by a Longs Drugs location, building permits have revealed. Tribune-Herald. State Senator Lorraine Inouye, State Representative Chris Todd, and Representative Mark Nakashima were featured speakers at Monday’s Japanese Chamber of Commerce & Industry of Hawaii general membership meeting. Big Island Video News. Authorities on the Big Island are cracking down on agricultural theft by attempting to eliminate the market for stolen produce. Associated Press. Drought-stricken Maui farmers eligible for federal loans. The United States Department of Agriculture has designated Maui County as a Primary Disaster Area because of the drought that's plagued the Valley Isle and neighboring islands for years. Hawaii News Now. The US Department of Agriculture has designated Maui County as a primary natural disaster area due to losses and damages caused by a recent drought. Maui Now. No Additional Fee for “Private” Postpartum Rooms at Maui Hospital. Effective Nov. 1, 2017, Maui Health System we will no longer collect additional fees for private postpartum rooms at the Maui Memorial Medical Center. Maui Now. The Maui News has reversed course and will use carriers for newspaper home delivery after all. It also will retain its Sunday edition after announcing in a front-page publisher’s note to readers Tuesday that it is rescinding its recent decision to use the U.S. Postal Service for home delivery instead of newspaper carriers. Star-Advertiser. A program that helps landlords get paid and helps to keep tenants from being evicted has expanded to Kauai. Star-Advertiser. Kauai renters and landlords have a new resource at their fingertips now that the state Judiciary has expanded an aid program for tenants and landlords. Garden Island. This week, 13 elders from indigenous tribes around the world are gathering on Kauai to hold ceremonies and talk story about the condition of the planet. Garden Island. Self-resetting rat traps are turning out to be the firepower conservationists needed to help control rat populations on Kauai. Garden Island. Kuhio Highway near the Hanalei Bridge is closed tonight due to flooding on Kauai, and a shelter at Hanalei Elementary School has been opened. Star-Advertiser.